Newsprinters is a newspaper printer and logistics business based in Hertfordshire. They print a staggering 20 million+ copies of the UK’s top titles every week. 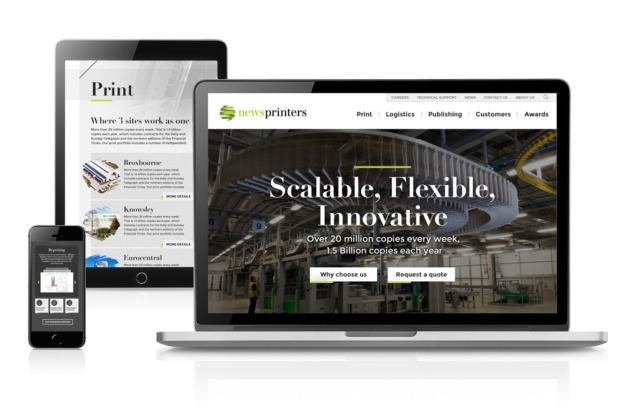 To create a visually engaging website that effectively illustrates the production quality, range of services, geographic coverage and scale of print capabilities. The Newsprinters site is clear, the navigation has been streamlined to produce a simplified user journey. We’ve incorporated striking photography, video and iconography to highlight key performance metrics and information. We undertook a User Experience (UX) discovery phase with the Newsprinters Team to gain an in-depth understanding of user groups and their objectives. The site structure and navigation were focused on enabling users to complete their top tasks on site. During project scoping we agreed project goals and objectives, agreeing roles, responsibilities and project deliverables. When considering a best fit Content Management System (CMS) for Newsprinters we chose WordPress because of its ease of use – the ‘What you see is what you get’ (WYSIWYG) text editor ensures the site can be easily and quickly updated by the Newsprinters Team. The CMS allows for multiple content formats to be incorporate on page – the Team can add text, images and video. WordPress is extremely flexible, future updates and developments can be easily incorporated with third party plugins and integrations. SEO was a key consideration for the new site, we worked with Newsprinters to optimise content and blog posts. We evaluated and updated, WordPress categories and tags and internal linking across the site. We created a design which integrated photography, video and iconography to highlight key performance metrics and information about Newsprinters. We used background video on the homepage to introduce the facilities and logistics, applying a mesh overlay to soften the video and increase the legibility of supporting text. We used icons in combination with subtle page load effects to introduce motion to the metrics with infographic inspired styling. We blended background photography to break up the edges of the content panels, softening the overall look of the pages. Prior to go live we assisted Newsprinters in content migration from the old site to the new site. The migration gave Newsprinters the opportunity to evaluate the relevancy of content and make any required updates before inclusion on the new site. CMS training was provided to enable the Newsprinters team to add and update content on the site. The new site launch was managed by our Account Management Team, an agreed launch plan was approved by Newsprinters and ensured a seamless transition from the previous site to the new site.